Who wants to appear on my album sleevenotes? Do you want your picture to be preserved for eternity in physical media? Your picture could be included on the inside cover of my album! The picture above shows the rough layout of the physical CD cover and inlay. What I am thinking is that (as on the bottom left section of the image above) a page could be devoted to selected profile pictures (eg. twitter or facebook etc) or similar sized (non-offensive, non-copyright) images. I can give these photo-grids away as mini-competition prizes, awards for things that people help me with especially promotion etc and also potentially as auctions. The grid below shows the current state of the grid and the slots which are taken. I’ll set up a devoted page to the photo grid (on the blog) and update the positions as they are filled by the photos. 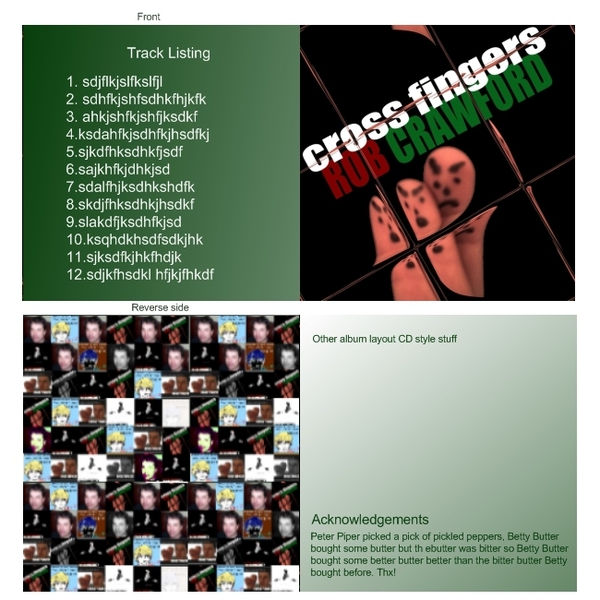 A version of this page will also appear on my ‘Cross Fingers’ website pages and can include links to your webpage, facebook, or twitter page as you like. As ever I think this idea has plenty of scope for discussion and any rules or ideas that I’ve mentioned are not definitely set in stone, so ask away if something is not clear….